Baker & Brewer Opening Soon! East Island Brewing Opening Soon! Famulari's Brewing & Pizza Co.
Indigo Reef Brewing Co. Opening Soon! Ship's Wheel (Cidery) Opening Soon! 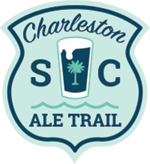 The Charleston Ale Trail is the sister publication of the Asheville Ale Trail. Subscribe to the Charleston Ale Trail Newsletter to stay up-to-date with the Charleston beer scene! © 2019 Charleston Ale Trail. All rights reserved.